Here’s a fun fact about me: my license expired in December and I haven’t gotten it renewed. Now, before you think I’m breaking any laws, I cannot tell you the last time I was behind the wheel. Maybe three years ago? Four? As a perpetual city-dweller, I’ve never owned –nor felt a need for– a car. In fact, I was 20 when I finally cracked and got my license; I paid for driving lessons and went through a red light on my first one, prompting the instructor to say, “Um, okay, that was a red light. We stop at those.” I can’t drive fast, I keep my hands in the 10-and-2 position, and I get the sweats at the thought of merging. But parallel parking? I am an excellent parallel parker. At least, I was three years ago. I’ve relied on my two legs and public transit for the majority of my life, and have never seen the appeal of paying a car payment, insurance, gas, parking, or any of the other costs that come with it. Sports cars do nothing for me. I honestly hadn’t given any thought to anything remotely vehicular since I was six, and my parents got me a bright red Ferrari for my Barbies. And then I went to Paris. 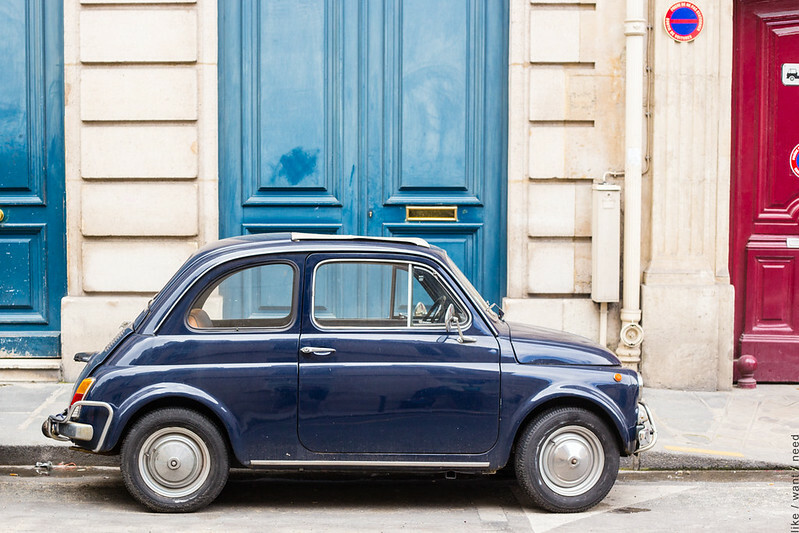 Where, while everyone relies on the metro or the buses, Parisians who have cars choose to have tiny, adorable cars. Vintage mini coopers; old, small Fiats; shiny, teensy Smart cars. No giant SUVs here, or oversized sedans people trade in every three years, no sir. Just wonderful, and wonderfully photogenic, little rides that startled me every time I saw someone emerge from one. For one of these pint-sized sets of wheels, I would happily abandon my permanent pedestrian status. but i always wonder, how much protection, one has, in them…? but yes, they arrrrrrrrrre cute!!!!! Driving freaks me out too AND I can’t parallel park, so you’ve got me beat :-) I would gladly learn to conquer my fears in these super cute minis! those are pretty adorable alright. i would very happily drive one of those around – though we might look like clowns stepping out of a clown car. i am not sure it would hold all us. portland is starting to fill up with the tiny eclectic cars. i am so happy they are catching on – i mean it’s kind of inevitable . . .
i am all about the use cars. i couldn’t imagine forking out more than the cost of insurance and gas to drive around?! i know people who have $500 car payments (whaaa?!). me? i hate driving. i either drive like i am 90 years old going 3 miles per hour, in no hurry, just trying to remember where my turn is. or i drive like an angry 19 year guy that’s been listening to death metal all day while drinking some rockstar, and i drive whilst stringing curse words together for strangers who aren’t following my superior driving rules. so either way i am yelling or being yelled at while driving and i find both equally offensive to my soul. Everyone in Pennsylvania can parallel park. It’s part of the driving exam, so it’s a must. And funny, what we noticed about Paris was how many people had *our* car… a Volkswagon Tiguan. We saw nearly a dozen of these in our super short visit. And while not a honkin’ big SUV, it’s not nearly as sweetly tiny as these. Wait, parallel parking isn’t on every driving exam? That’s crazy! I laughed the entire time I took lessons, because the space they set up for you to practice parking is about 15 feet long, when in reality you end up trying to squeeze your car into a space that maybe half your car will fit into. Minis are the cutest! I don’t think I could ever own one for an extended time considering they are smaller than small and I have to drive on a highway everyday which is scary enough. I don’t mind driving, but nothing beats public transportation in a city. Wowza, I wouldn’t think that would be possible! I hope they were okay! I drive a Nissan Versa hatchback, and when I first bought it (five years ago) all of my colleagues and friends laughed at me for buying such a small car. But I love it! I can fit her anywhere and the mileage is great. Then I went to Europe and laughed because compared to the majority of the cars there, my car is actually on the larger side! I don’t understand all of these SUVs and larger vehicles; unless you have a family of 5+ or you’re towing something on a regular basis, there is simply no need for such things! I’m happy that I don’t rely on my car so much since moving near Philly, I mainly just use it to get to and from work… but even that’s a stretch because in theory I could easily take the train to work. Ultimately though, it’s actually cheaper for me to keep the car around (considering it’s entirely paid off and I’m just paying insurance on it). If I worked closer than 9 miles from home though, you can bet your bottom I’d seriously consider getting rid of that car. Right now, I live in the suburbs so I need a car to get anywhere. The dream is to move downtown though so I can be car-free and carefree! SWOON! 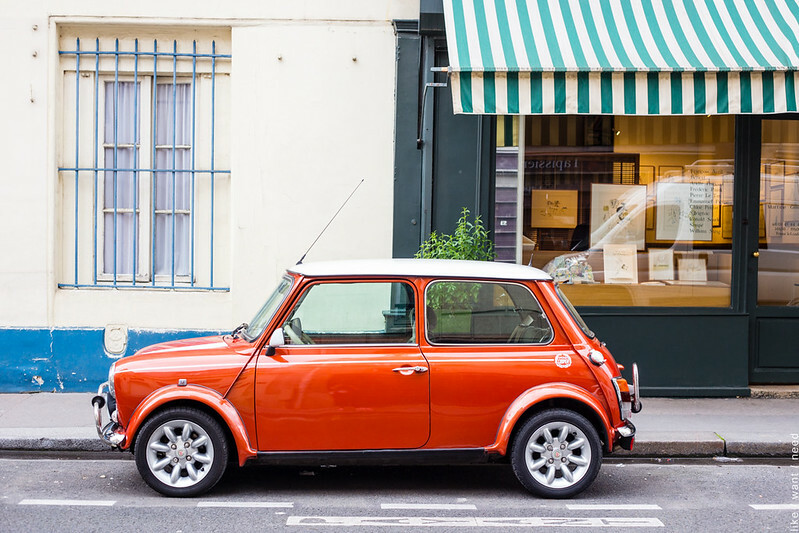 A vintage mini cooper or fiat ismy dream car! Side note: what are you going to use for ID if you get carded at a bar? Passport?